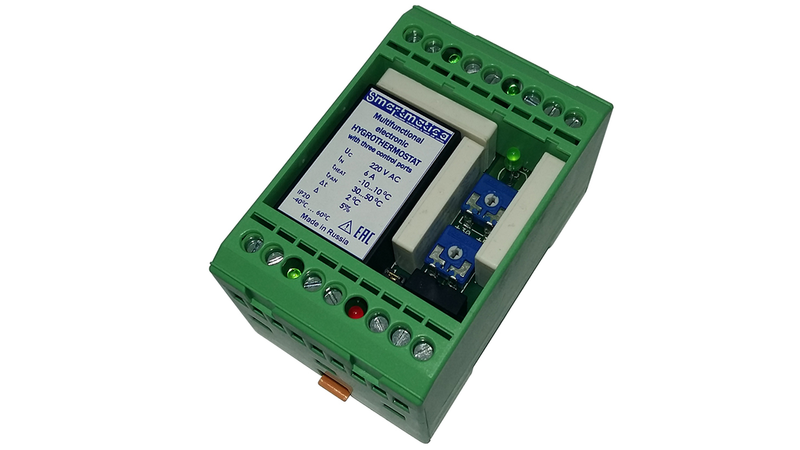 Multi-functional hygrothermostat with three control ports is developed to control temperature and humidity in enclosures of various applications. - ”Mode 1” the device supplies power to the equipment when the temperature and humidity are set by the settings. - “Mode 2” the device provides energy efficiency by turning on the fan for cooling, and in case of insufficient efficiency it turns off the fan and turns on a more powerful cooling device (air conditioner or other cooling device). To prevent corrosion processes and to protect against excessive humidity, the device provides an increase in the dew point at a critical excess of relative humidity (above 65%), and thereby prevents appearance of condensate.